We have a Good Father. Every good gift. Every perfect gift. 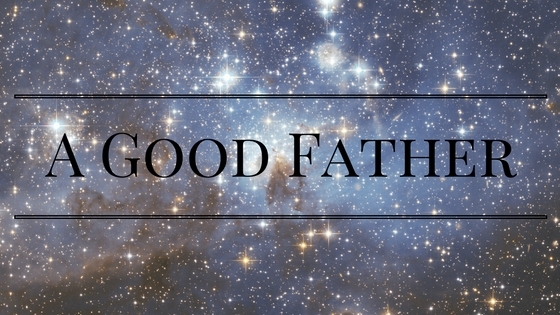 As believers, we have a Good Father. Quite frankly, the best Father. We know that there is none greater than our Father God. But do we know that there is none better to us than our Father? Do we really understand, grasp how good Our Father God is too us? Comes down from the Father of lights. With whom there is no variation or shadow of turning. We can start at the beginning of God’s Word and journey to the end to see time and time again that Our Father gives good gifts. He hasn’t changed. He won’t change. (Malachi 3:6) He heals the sick, restores the lost, mends the broken, frees the captives and makes the dead come alive. 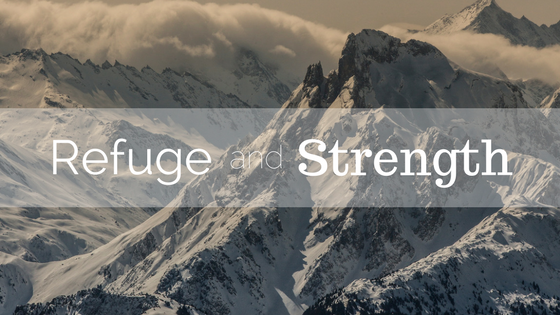 I can’t explain to you how much this biblical perspective of Our Father and His Nature matters in framing our lives. If I know God, through His unchanging, inspired Word, then when the enemy comes in to try to steal, kill and destroy (John 10:10) I can identity the fox in the chicken coop. I’ll no longer blame the work of satan on my good Father. No, we have a Good Father from whom all blessings flow. I’m a gearhead guy. I love gear. I love talking gear and finding out what other guys use. So here’s a little series of what I use. Gear for me, it not only makes the job easier but lots of the time it makes me capable of completing the job. For instance, I have a cheat sheet on my board that I can glance at for guidance if need be. Nothing fancy, just a few quick notes that I’ve jotted down during practices (which by now I have committed most of the content by memory) to help me remember the chain sequences for certain songs. I guess I’m a purist in a sense. I love to play a song the exact way its recorded. Don’t get me wrong, I love a unique break out of a cover song that has been reshaped and changed to be a completely different animal. But as for my original music, I want it sound exactly the same live and recorded. I want the same energy that happens in a live show to be conveyed in the record and the same technical exactness found on the record to be translated live. Let’s be honest, who goes to their favorite band’s concert and says “I can’t wait to hear all new songs and NOT be able to sing out loud til my voice is gone.” No, we all love hearing our favorite songs played by our favorite bands. And to do this, lots of time you have to rely on your gear to replicate the intricate sounds and tones you generated in the studio using software. I have small board compared to other guys but everything on board I love. 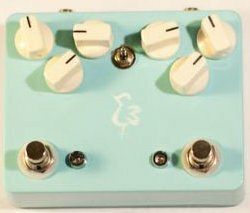 My favorite pedal right now is the Thunderbird pedal made by Keisman Pedals (picture above, you can check out a demo here The Thunderbird) This is one the best and most solid drive pedals I’ve ever played. (No I’m not endorsed, but if you’re reading this Keisman Pedals feel free to send me your Midnight Drive Pedal and I would gladly share my opinion!) The Thunderbird is two pedals combined into one. The Velvet Drive and The Early Bird. The Velvet Drive is a thick drive that has a lot of meat to it. I love to use it for leads galore. Throw in a little ‘Verb and you’re in face-melting Heaven (yes it’s an actual place). The Early Bird is beautiful, harmonic light drive. It adds a very welcome bright drive to lots of the songs my band plays. Its a drive that if you pic or lightly strum you barely hear the distortion but if you punch the chord it really sounds out with some grit. The pedal is a True bypass which is always a plus. The Thunderbird is definitely staying on the board for good. The variance of tone it can generate on the dark and bright side is to vast to not keep it around. If you’re looking for a drive pedal this might be the one for you! I’ll share more stuff on my board later.